ENVIRONMENTAL & CIVIL RIGHTS DISASTER! "You should not let the coyotes guard the sheep pens"
Norton at Interior - fairness for Indians, or Watt now? Congress will soon vote on whether to accept George Bush's nomination of Gale Norton as the Secretary of Interior. As the highest environmental post in the nation, the Secretary of Interior oversees 500 million acres of public land including all National Parks, National Monuments, and Wildlife Refuges. The Department of Interior also oversees the Bureau of Land Management, Office of Surface Mining, U.S. Fish & Wildlife Service, and the Bureau of Indian Affairs. Thus Norton will have influence over hundreds of millions of acres of grasslands and desert, all mining on state, private and federal lands, implementation of the Endangered Species Act nationwide, and the lives of millions of Native Americans. Norton's career from her first law job at the Mountain States Legal Foundation in 1979 under James Watt, to her stint at the Department of Interior (also under Watt), to her role at Attorney General of Colorado, to her current tenure at NL Industries (formerly the National Lead Company) has been a war with the Department of Interior and federal environmental laws. An extreme "states rights" and "devolution" advocate, Norton has lobbied, litigated, preached, and tried to manage federal environmental laws and lands out of existence. She and her proteges have argued in court that the Endangered Species Act and the Surface Mining Act are unconstitutional, even though as Secretary of Interior, it will be her job to enforce them. They have attacked Native American religious practices and fishing rights even though as Secretary she will oversee the Bureau of Indian Affairs. They challenged the ability of the National Park Service and U.S. Fish & Wildlife Service to protect endangered species and parks. She will also head those agencies if Congress approves her nomination. Norton is openly hostile to federalism, federal laws, and federal lands. She is the antithesis of every value the Secretary of Interior is trusted to uphold. Norton opposes federal laws requiring the removal of asbestos from schools and is a lobbyist for a chemical company charged with poisoning children with lead paint She has argued that pollution is a right, not a crime. She submitted legal briefs supporting a lawsuit by the oil industry to strike down a federal oil tax. Within minutes of being nominated for Secretary of Interior she endorsed opening the Arctic National Wildlife Refuge to oil drilling. As Attorney General of Colorado Norton refused to defend a state law guaranteeing minorities access to highway construction jobs. She opposed implementation of the Americans With Disabilities Act, federal civil rights statutes, the Violence Against Women Act, and asserted that southern state's rights were trampled upon by the civil war. Norton is fellow at the Political Economy Research Center which is funded by Amoco, ARCO, the Chemical Manufacturers Association, Conoco, Eli Lilly and Co., Pfizer, and Coors. It favors auctioning off all federal land to the highest bidder. This includes the National Parks, National Monuments, Wildlife Refuges, BLM land and historic Civil War battlefields that Norton would be trusted with protecting as Secretary of Interior. 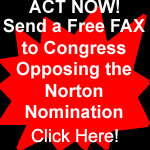 Send a free internet fax opposing Norton today!